Eliminating infection transfer across wards. Fast, efficient and safe disposal of Disposable Pulp products. Converts pulp and waste into fine particles allowing for standard disposal through the drainage system. No waste collection; Minimizes opportunities for cross contamination. Having a Solo® installed in the bathroom of each individual hospital isolation room helps prevent potential hospital-wide contamination by eliminating the need to remove used bedpans from isolation. Current practice with single room bedpan disposal is to use a communal disposer in another ward or to treat the bedpan as clinical waste and double bag. This means disposal of the bedpan takes place out of isolation which can potentially contaminate the general hospital environment. 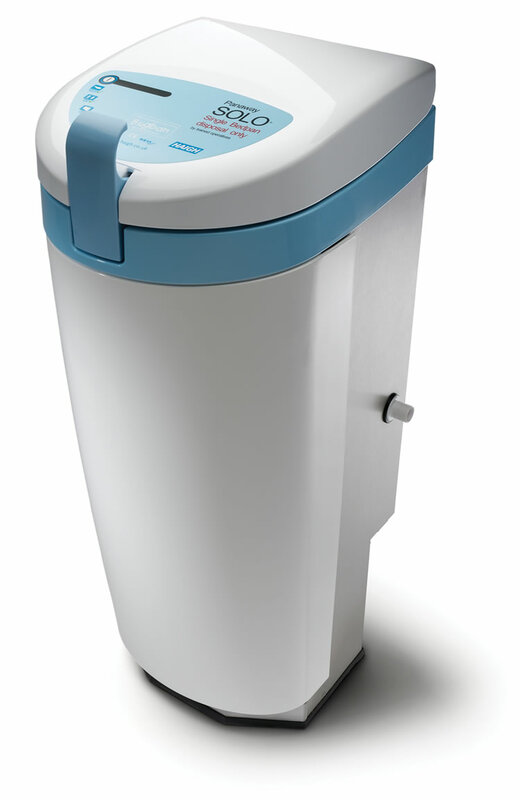 Disposing of just one bedpan at a time, the Solo® is designed for installation in single bed wards. When a used bedpan is ready for disposal the operator walks up to the machine and pushes the lid handle, allowing the lid to rise automatically. The bedpan is placed inside, the lid closed and the start button pressed. In under a minute the machine breaks the bedpan up and flushes it and its contents away completely. Copyright © 2011-2019 AMG Medical Inc. All rights reserved.